MORE than 20 people are said to have been hurt after a man went on a violent rampage with an axe. The assailant is reported to have gone around attacking people on a train in Germany, according to local media. The time for sensible axe control is over. Ban them! 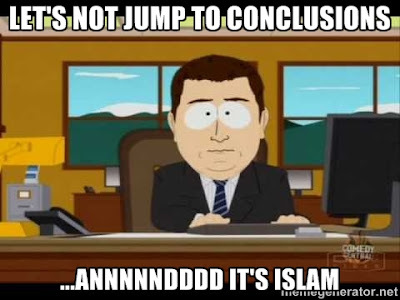 Unconfirmed reports assailant shouted 'Allahu Akbar' in suspected Islamist attack in Wurzburg, southern Germany. Authorities have now announced that the attacker was shot dead by cops as he attempted to flee the scene. Europe should not only refuse to accept any refugees, children or adult, it should send all of them back to their native lands. What happens to them there is not going to be as bad as what is going to happen to them in Germany and France, two nations not historically known for their gentle treatment of invaders. This is something that is completely missing from the majority Muslim mindset. They hate infidels. The result: Orlando, Nice and now Wurzburg. When the infidels of the West got angry in the past, the result was Dresden, Hiroshima and Nagasaki. Today, the West is capable of turning the entire Islamic world into a smooth sheet of radioactive glass. The Muslims, in their never-ending stupidity and malice, keep pushing towards that horrifying future.